We drove straight through to Ohio to our friends, Mike & Donna Gibson -- leaving after church at 2 pm and getting to their house at 8:23 am this morning. I had maybe two hours sleep the whole night but just couldn't go to sleep once I got here because I was enjoying talking to them so much and well...just put sleep off for later. I'm exhausted now at 11:45 pm and needing to crash, so will not be blogging long. Today we drove to our old house, old church, hospital where Jordan was born and spent lots of time sharing with our friends. We have tons of photos but I'm just posting this one for time's sake tonight. More later tomorrow if I have time. I'm only on line a few short minutes a day if that, but I am twittering from my phone throughout the day to share what we're doing for any who are interested. If you aren't already following me on twitter, this might be a great week to start if you want to. :-) On days that I might not have time to blog I will make time for a few tweets. 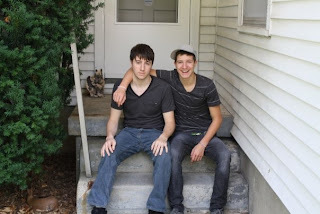 The boys re-enacting pose from photo on steps of our old house on Kratochwill St. in Dayton. They sat in this same spot at 2 and 3 years old for photo like this. This was our home for almost four years. Jordan was born while we lived in this house. 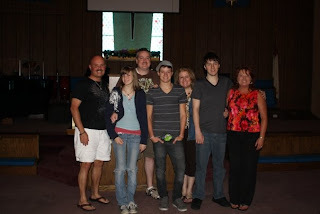 Shrodes and Gibsons at our old church where we met ~ Gospel Temple AG; We were on staff there as youth pastors. 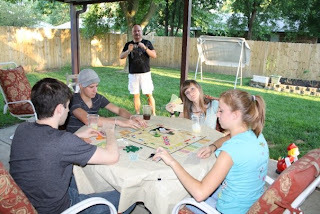 The kids (Dustin, Jordan, Savanna, Emmy) playing monopoly in Gibson's back yard. Mike was taking a photo too. They have all been getting along quite splendid. The Gibsons make us a wonderful dinner. 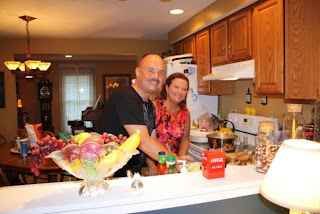 Such awesome hosts...we are blessed to have them as our friends. The time is really going too fast and I wish we had more time together. G' night all...I am completely spent but it has been a wonderful day right down to going to a playground with the kids (Savanna's suggestion) and eating Donna's amazing banana pudding.